With the National Science Foundation’s most prestigious award for junior faculty members, the CAREER Award, NC State University’s Anna Stepanova is developing molecular tools to precisely control where and when auxin, a hormone that promotes plant growth and development, is made. “We often take a regulatory sequence of a gene to drive a gene of interest in a specific location. We have a collection of drivers or promoters that allow us to express certain genes in specific tissues, but they’re usually leaky,” being expressed in tissues other than the ones targeted, she said. That, she added, could lead to unintended consequences. To explain, she used the example of a root-specific promoter designed to activate the production of a toxin that kills off a worm that chews up a plant’s roots – but the toxin is also activated, to a lesser degree, in the shoot. 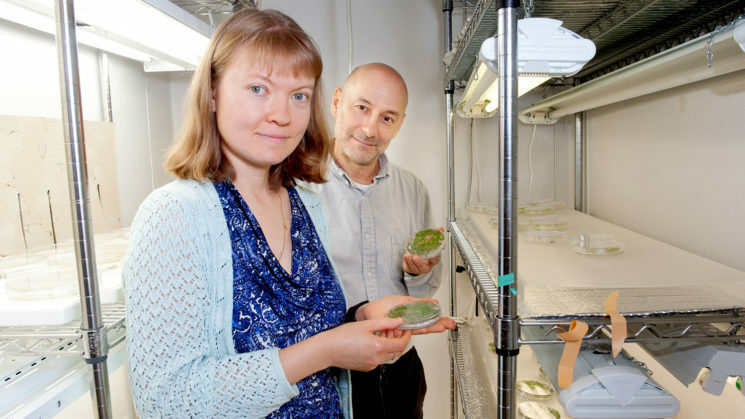 Stepanova, an assistant professor of in the Department of Plant and Microbial Biology, will focus her study on auxin, a hormone important in the regulation of plant growth at every stage. Using CRISPR-Cas9 technology, she plans to create a biological logic gate that can turn auxin biosynthesis genes on and off to manipulate plant growth, especially in the root. Meanwhile, she plans to use the materials and protocols developed through the study to create a university course with laboratory work as well as lectures related to synthetic biology. The biotechnology course for upper-level undergraduates and beginning graduate students will focus on applying engineering principles to create biological systems or components that don’t exist in nature. Stepanova also plans to expand her outreach program, Plants4Kids, designed to expose elementary students to basic principles in plant biology. For over seven years, she and her lab members have delivered live demonstrations at museums and schools, as well as via a dedicated website, in Spanish and English, of easy plant experiments. With support of NSF and local companies, she intends to reach a new audience: high school teachers. She will offer a teacher training workshop on synthetic and molecular biology and establish a free lending library so teachers have access to equipment they can use in their classrooms. Her lab members will also assemble and test reagent kits for the teachers. Another way Stepanova supports research is by serving a 5-year term on the North American Arabidopsis Steering Committee. Arabidopsis is a small, flowering plant that she and many other plant biologists use as a model organism in plant biology. The committee promotes Arabidopsis research, mediates interactions with Arabidopsis scientists abroad and seeks funding from federal agencies for Arabidopsis conferences and workshops. It also organizes the International Conference on Arabidopsis Research when it is held in the United States and funds travel of U.S.-based scientists when the conference is held abroad. The plant hormone auxin is an important plant-made growth regulator that governs multiple aspects of plant growth and physiology and acts at every stage in the life of the plant. The goal of this project is to generate new molecular tools to precisely control where and when auxin is made as a way to manipulate plant growth, particularly in the root. Taking advantage of the powerful gene editing and targeting technology (CRISPR), this project generates programmable genetic devices (biological logic gates), that make it possible to turn genes of interest (such as auxin biosynthesis genes) on and off at will. The basic principles and tools developed in this project have the potential for broad applications in agriculture and beyond. The protocols and materials generated in this study serve as the basis for a new Synthetic Biology course for upper level undergraduate and beginning graduate students at NC State University. In addition, the investigator has adapted some of these materials for workshops that provide training and resources for high school teachers. The investigator also establishes a molecular biology tool “lending library” that enables local teachers to execute molecular experiments in their classrooms. Furthermore, continuation of the previously established bilingual (English and Spanish) hands-on Plants4Kids demonstrations with live plants and seeds at the N.C. Museum of Natural Sciences and local elementary schools brings the excitement of experimental sciences to the youngest audiences. These activities expose young people to scientific methods and demystify agricultural and plant genetic techniques. Biology research is often restricted by the choice of promoters available to drive the expression of genes of interest in complex patterns and at desired levels. To overcome this limitation, a series of easily programmable CRISPR-based synthetic genetic circuits are developed to integrate multiple inputs from previously described synthetic and natural promoters. These new tools take advantage of crRNA:tracrRNA gRNA pairs and combine inputs from two or more different drivers/promoters to delimit where a dCas9-based synthetic transcription factors activate or represses target gene expression. 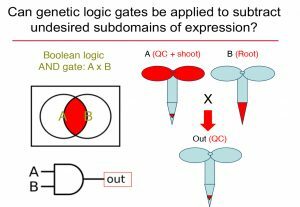 The proposed approach rests on two or more pseudo-orthogonal gRNA pairs and is compatible with the construction of all basic logic gates to produce multiple derived patterns of targeted gene expression. In theory, this technology can produce hundreds of orthogonal genetic components that in combination perform complex logic operations. The new strategy is not only scalable, but also enables tuning of gene expression levels, thus providing an unprecedented degree of flexibility in targeted gene expression. To demonstrate the utility of the new approach, the investigator regulates the tissue specific expression of local auxin production in roots in an auxin-deficient mutant and interrogates the effects on root architecture, thus addressing a long-standing question on the role of local auxin production in maintaining the stem cell niche or plant roots. This post was originally published in College of Agriculture and Life Sciences News.